If the power of attorney was non-durable, then in that case the power or authority would’ve been transferred to someone else or perhaps the attorney would’ve been terminated due to your incompetence or disability. But due to the durability clause, the authority or power mentioned in the form remains in effect and an attorney-in-fact or appointed agent can fill the role on your behalf. Disabilities and mental incompetencies can happen as a result of various reasons such as illnesses, injuries due to accidents or health issues. People who get to know beforehand of their terminal illnesses through diagnosis tend to prepare a durable power of attorney so that it is assured their financial matters and property would be managed by someone they appoint when they become unable to do so by themselves. If you believe you only want your agent or attorney-in-fact to be given the authority or power mentioned in the form upon your disability or mental incompetence, then you have to add a statement in the form which clearly states this line. This is called “springing durable power of attorney” in which the authority or power is not granted to the attorney-in-fact or agent until and unless you are declared and certified as mentally incompetent by a licensed doctor. 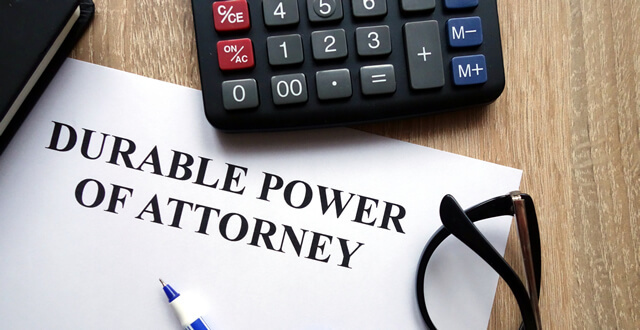 In most cases, the durable power of attorney forms immediately take effect upon being signed and the person who is listed as the agent or attorney-in-fact is granted the power instantly. Though, it is necessary that despite whatever the reason you may be using the form, you ensure that the person you’ve listed is someone you can trust. This is because this person will be the one in charge of your financial affairs and property, and you have to mention this clearly in the form. It isn’t necessary that you choose a lawyer as your attorney-in-fact or agent. It is rather recommended that a trusted person is given this job. An attorney-in-fact or successor agent, lastly, may be appointed regardless of the inclusion of the durability clause. This appointment is essential and should be included in cases where the attorney-in-fact or initially appointed agent fails to serve their duty. The successor then, acts on your behalf if it is required without the requirement of fulfilling another durable healthcare power of attorney form.